Convert cassette tapes to digital files! 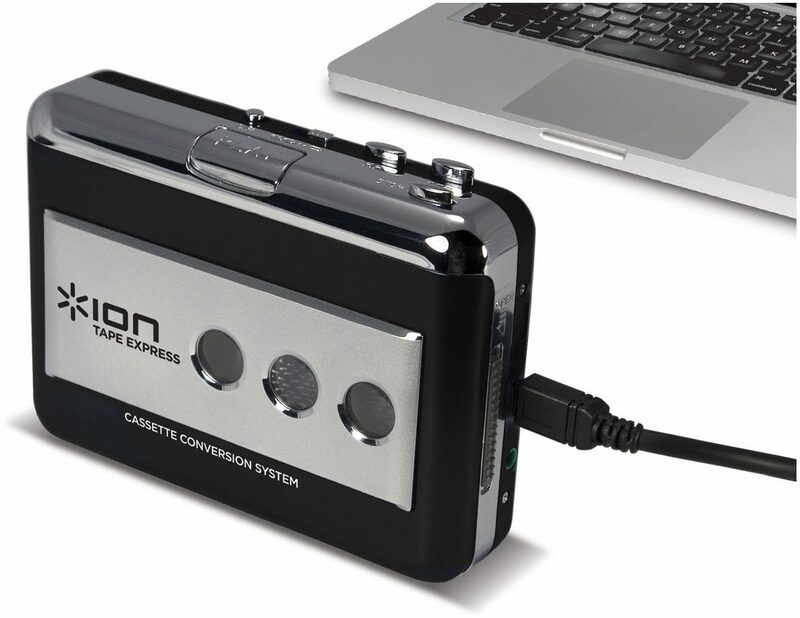 This cassette player connects to your computer via USB, and comes with software for transferring your tapes to MP3s. 55 of 61 people (90.16%) found this review helpful. Did you? Music Style: Rock, Blues, Originals, Covers, Top 40's, Country. Anything from the 50's thru now. All the real music! No C*rap! Overall: Made of cheap plastic. I had to hold down the play botton, hard, while the tape was playing, to get the right channel to come in clear. The tape plays fine on my old cassette deck. The included software records directly to iTunes and it's pretty basic. After the first attempt, I deleted the software, and use Audacity instead. You've got a lot more options in tweaking the sound and formatting. If you can't find anything else, this is an okay product for converting your cassette's....but if you want to convert important stuff, I'd look for a better option. Considering how cheaply it's made, I don't know how long it will last. 40 of 44 people (90.91%) found this review helpful. Did you? Overall: The Ion Audio Tape Express Cassette to MP3 works well. It takes a little bit of study to figure out how it can best work for you. The machine itself is flimsy plastic and should be treated with care, but it does what it is supposed to do. The music is first transferred to I Tunes, but when I tried to play it on my Windows Media player, it can't be read. Quick Time player does work, but you can't load more than one song at a time unless you choose to record an entire album as one song. Of course, then you can't list or play just one song by title. Nevertheless, there are some options for doing the transfer, and probably somebody more savvy than I can figure out how to format the individual songs with titles that will play on Windows. The machine is indeed worth the price; I figure I made up the cost after having transferred 10 old 60's cassette albums to digital. I still have about 200 more to go! It takes time and vigilance to name the songs and make sure the tracks start and end at the right spot, but it's something to do while listening to the tunes and remembering the 60's! Sound: Poor Feature: Control of volume is not easy to access. Software to limited and does not seem to transfer information properly. Quality: Poor Value: I paid 69.00 for something that doesn't work. So... No the product is not worth it Manufacturer Support: Not impressed with this company The Wow Factor: No Overall: Bought this hoping for an easy audio transfer to my computer. The first one broke in a week. The second in a day. The software allows you to log your tape info, however this is all lost when it transfers into iTunes. A waste of both time and money. Do not recommend buying this cheaply made devise. Musical Background: long time . guitar.bass. all types . mostly recording at home . Music Style: classic rock ,classic country ,blue's . southern gospel . Overall: If your looking to convert your own are commercial music to C.D, format from cassette tape this is a waste of money . I own one of these .I used it twice .three times was not the charm either ? yes I tried again . went back to Roxio to burn my disc from cassette. the quality I got from this Ion Tape Express left a lot to be desired . the only plus it would get from me is that it is easy to use . That's It !! Overall: It does the job. It repeats the exact quality of what you're transferring. Overall: Purchased this product to archive my analog cassettes to a digital format. Functionally the product works as advertised. However including an A/C adapter would have been nice rather than just relying on batteries especially if you have a lot of tapes to convert. (I called the manufacturer to get the necessary info to choose. Listening through the earphone port on the unit I could hear a 60hz hum which was transferred to the digitized results but not as audible. Fidelity of the audio content in spite of the 60hz hum is was good. USB connectivity works as advertised. Auto reverse function workedl, but it began to cause tape jams. Then the unit began to eat tapes with the reverse function off. That's when i stopped using the unit. Musical Background: Long background in piano, voice, writingâ€¦.. Overall: A few minutes into recording, it switches back to ask me to start recording. When supposedly done, my only option is to quit which deletes everything. There is nothing to indicate how to send whatever I might have to iTunes. There is no number to call for help or even customer service address.